At a recent presentation on space saving and convertible furniture for interior designers at 200 LEX, the New York Design Center, I asked the questions, “who here has ever had an apartment in New York City that needed more space... maybe your first apartment?” and “who here has helped a client with an apartment in New York City that needed more space?” Everyone chuckled and their hands shot straight up, because they could relate. There is a developing trend throughout the world and here in the New York Metro area towards smaller and smaller living spaces. We see this in new developments in modern urban living as well as the tiny house movement. In 2013, the City of New York permitted apartments of only 300 sq. ft. to be built on Manhattan. 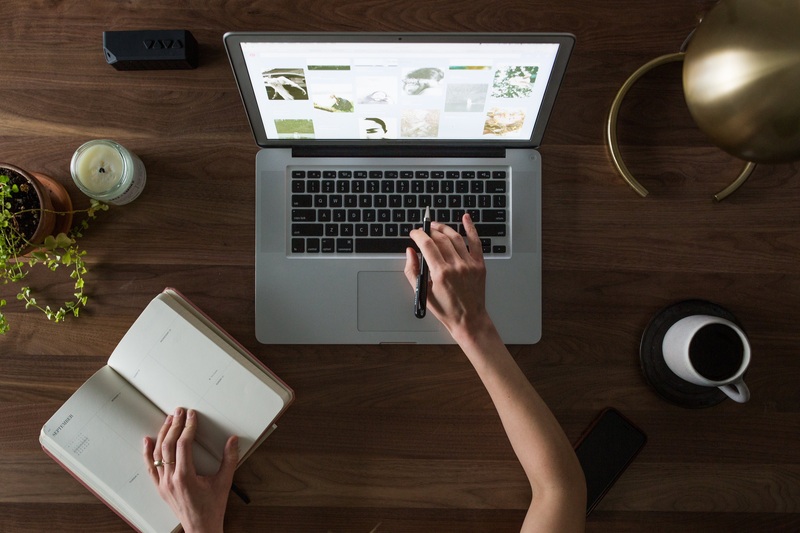 This trend has sparked an unspoken competition in the interior design community to see how comfortable we can be with smaller homes and apartments. The question is: how do we provide people with a solution for their lack of sufficient space within the available square footage? The answer is: “A combination of ideas for great design, a focus on functionality and the integration of hardware and technology provided by leading European manufacturers” says Daniel Steps, head of Design Research and Product Development at transFORM custom built-in interiors. transFORM overcomes the space efficiency challenge with convertible and custom combinations of built-ins that meet the resident’s specific needs and deliver more quality of life per square foot. 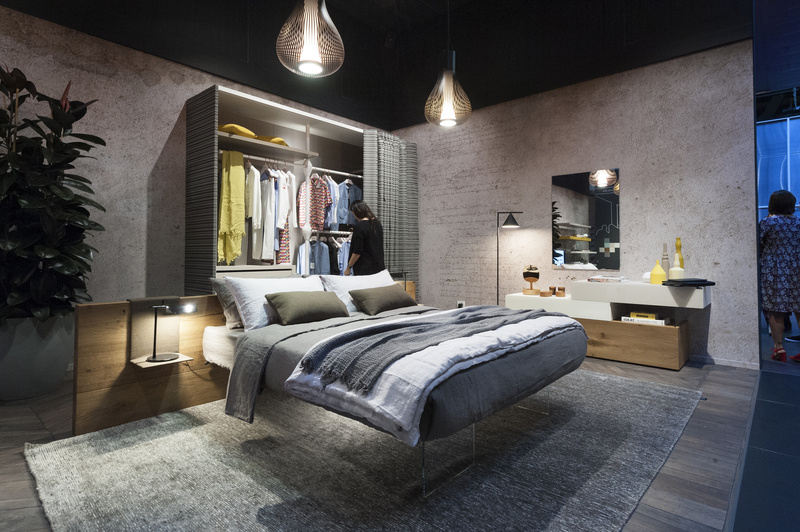 The latest and best example of this is transFORM’s wall bed, media unit, closet, laundry station and storage combination found in their Manhattan Showroom at 200 LEX. 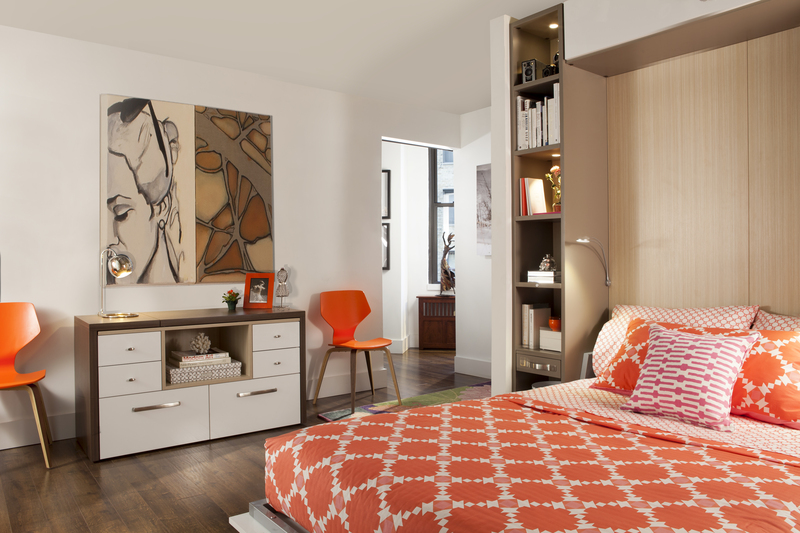 The unit contains 22 smart storage features that create comfortable living in a room that is only 175 sq. ft. Some of the space-saving features include front to back hanging sections to decrease depth, a covered drawer that doubles as storage and a bedside table, inset lighting, corner storage, removable laundry hampers and a hiding fold-out ironing board that fits in a small drawer. The room even includes a convertible table with a swivel top that swings out to become a desk. Some new projects coming from transFORM now, that also exhibit their smart design philosophy, include a horizontal wall bed with a parallel lowering desk, an extendable table that pulls out of a drawer, and coplanar sliding doors that sit end to end when closed for a smooth appearance that uses less space. As populations leave the suburbs to re-urbanize, people stay single longer, and the economic downturn lingers, the demand for affordable rentals is going up. These spaces are more energy efficient and can put more people closer to a city center, where they have access to the culture, art, music and food that are essential parts of their modern life. The problem with this new class of living space is storage. The size of the space inhibits the residents desired lifestyle by not providing enough room for the hobbies and activities that make them unique, that make them New Yorkers. Now it’s up to a new class of out-of-the-box, forward thinkers like transFORM to create more from what we see as less. These innovators will help to pave the way for better living spaces that adapt to the way we live, and not the other way around. Donovan Malloy is the marketing director at transFORM.